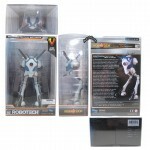 Since this is a vinyl toy with essentially no frills it’s kind of nice of Toynami to encase it in a clear plastic box. This allows potential buyers to really examine what matters most in a vinyl toy: whether or not they like the look of it. Generally I’m not a fan of large windows on boxes because typically they make the boxes more fragile but this battlepod box seems pretty sturdy. Unfortunately, there’s absolutely nothing you’re not seeing when you look at the battlepod inside. There are no hidden extras or anything like that. You won’t find a heavy or light missile attachment any where… you’ll have to buy those separately molded into the existing toy. This was the best rendition of the battlepod to date though the Hi-Metal R toy now gives it a run for its money, especially if you look at more than just one piece of line art. 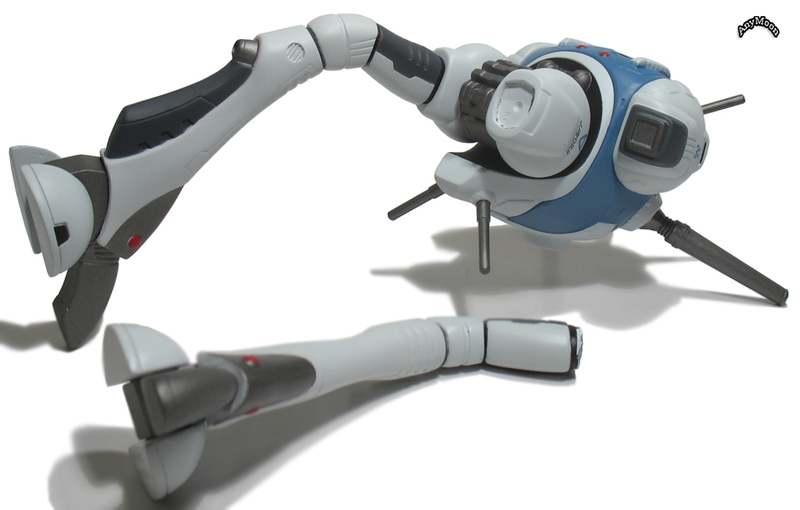 The toy is practically a 3D rendition of the line art above which is very impressive. The only thing that could have really been done better, on a vinyl toy, is some more pre-painted detail. The real trick though would have been for Toynami to make this toy out of plastic and feature some transluscent bits and maybe some interior detail… they couldn’t justify doing that but it’s exactly what Bandai has done with the Hi-Metal R.
I like the toy, I like its simplicity, but there’s nothing really to judge from a design standpoint so I can’t give it a good score. It has hip joints and a waist but it’s otherwise a few assembled hunks of vinyl. 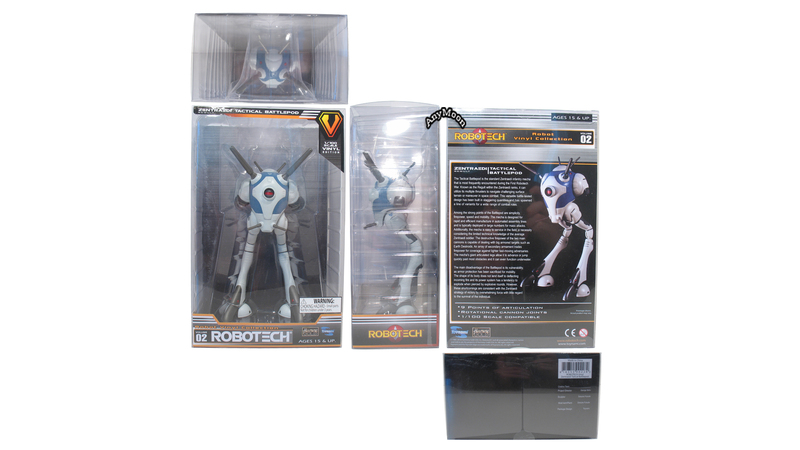 The toy was originally planned to have knee joints but those were eschewed at the last minute (unfortunately, the boxes had apparently already been produced as the box art indicates the toy DOES have knee joints). 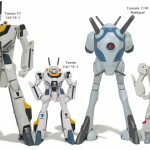 The dream battlepod toy has swappable missile parts, an interior compartment that opens, and an articulated Zentraedi figure that can fit inside. 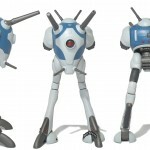 This toy is miles away from the dream battlepod toy. I’m tempted to give this toy a lower score because I had a leg pop off while posing and I read that some MWers encountered the same issue. Fortunately the problem is just inadequate glue on the leg. The fix was simple, apply more glue, but it’s a silly thing to have happen on such a simple toy. Since it’s just a case of under-gluing, and nothing is broken, I’m not going to be too hard on this otherwise very sturdy (albeit light) toy. It’s a hunk of vinyl though, don’t leave it next to a radiator or smash it under something heavy for a prolonged period. 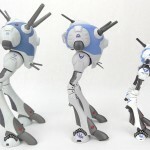 The legs move, the waist swivels, and the main guns are ball joints. 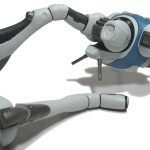 That leaves this toy with quite a bit it can’t do and just enough range of motion where if you had a few on the shelf you could differentiate them from each other. If you’re looking for something truly dynamic then definitely go with the Kaiyodo Revoltech offering. It looks good, it handles well, but it’s really not much of a toy. If you need a battlepod/regult to stand there while your valkyrie toys bust incredible poses shooting at it, then this will do the trick. This toy makes a great backdrop to displays of Toynami 1/100 VF-1 toys as well as Bandai’s Hi-Metal (and Hi-Metal R) VF-1, Yamato’s Gnu-Dou VF-1, and Kaiyodo’s transformable VF-1. 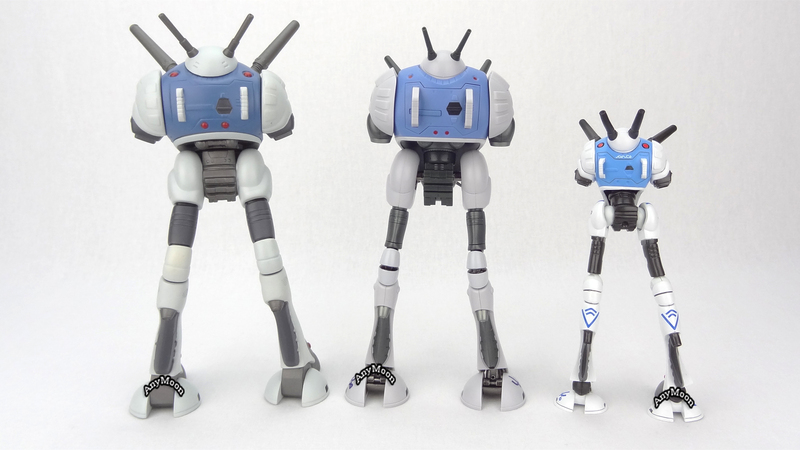 Some might say “Hey, you get what you pay for” in regards to this toy’s simplicity… but that sort of ignores the cheaper Kaiyodo Regult which has a ton of articulation and more pre-painted detail (at the expense of being much less sturdy). 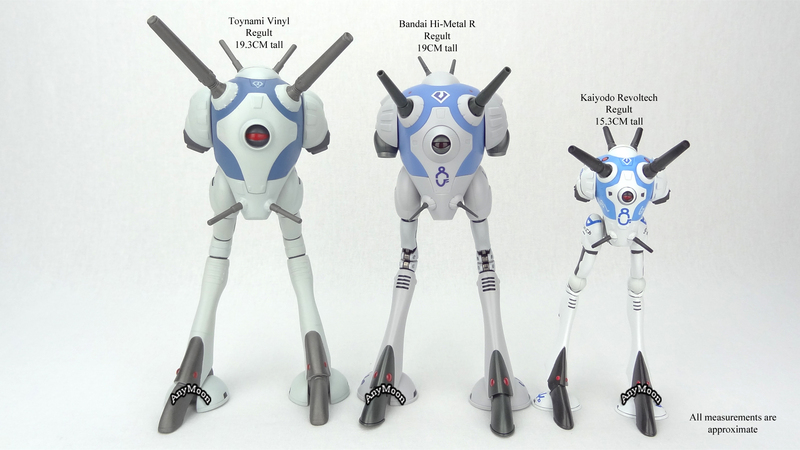 Unfortunately for the Revoltech Regult, it doesn’t really scale well with any toys leaving a very nice niche for the Toynami vinyl battlepod. I’m not going to say that this $20-$30 toy was expensive for what you get… but I would fall short of saying it’s a screaming deal. 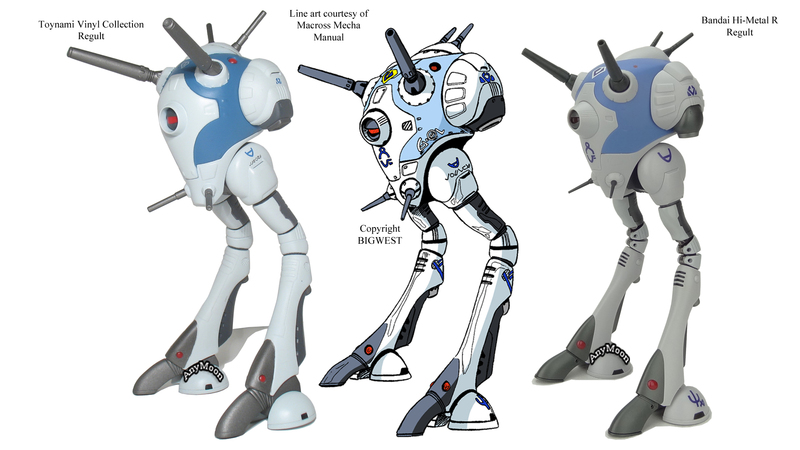 Before Yamato was shuttered they produced a very expensive, 1/60 Regult model but, despite being made of a plastic resin, it was notoriously unstable and certainly not suitable as a toy. Updated March 20, 2016: Added info and pics of Hi-Metal R release and added the information of all variants that were released including MSRP, quantity, and release date. Updated April 20, 2016: Added HD Video review. 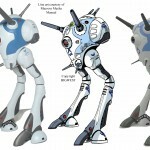 Judging from your “Toynami-Battlepod-4.jpg”, that’s a pretty darn accurate toy. I think this is the first time I’m happy with a Toynami product (I haven’t opened mine). And, I never realized how big the Yamato VF 1/60’s were compared to it (I have yet to transformer one of those either)… I got the HA version on the way, wonder what else is different besides the missiles (Q: do the HA version have different tampo printing on them?). Thanks again for a great text and video review. Q: Was your packaging kinda shelf-ware scratchy? The HA came out so quick I doubt much has changed… good question about the tampo, I’m afraid I don’t know the answer to that. The “box” my Battlepod came in was shelf-ware scratchy but it was only noticeable in certain light (which I guess it to be expected from clear plastic). Note: All scale pictures in this review are ACTUAL, not my normal photoshop job. That’s not to say my photoshop jobs aren’t accurate, they’re normally based on a different picture with the same products together, but this time there’s no chance for any error. 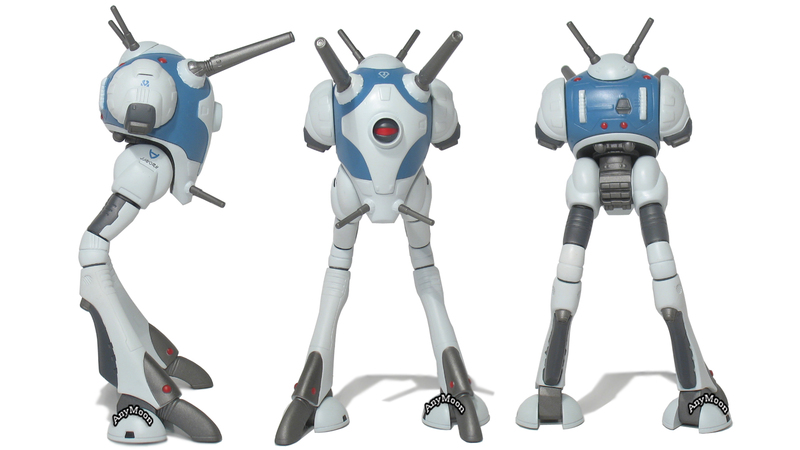 Again, you and I are on the same page with the Toynami Regult. 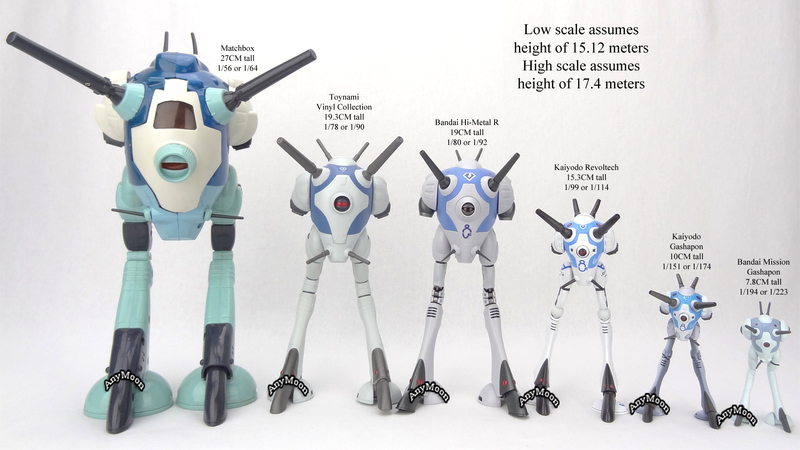 I was also confused about the scale, especially with the conflicting figures between the Macross Mecha Manual and the Robotech.com Infopedia. 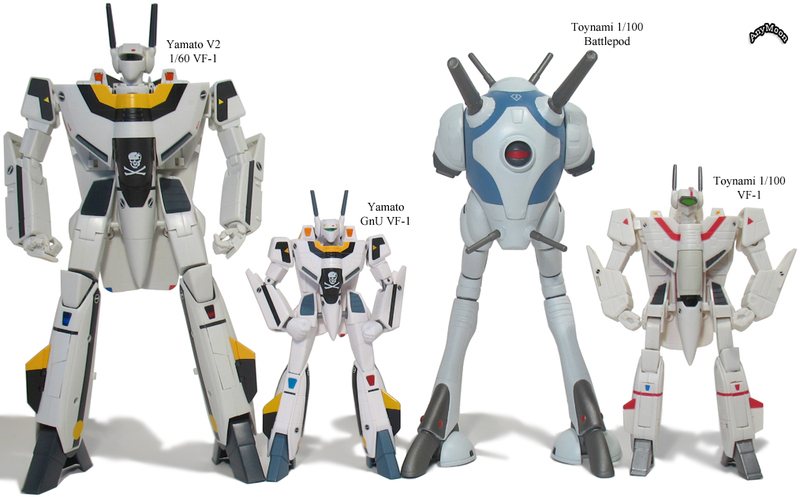 I also highly agree that the Toynami Regult plays well with the Yamato GN-U VF-1’s, as I’ve just recently set one up with the Roy Foker VF-1S GN-U. 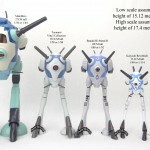 Speaking of scale, I’ve seen the infamous picture of the Yamato Regult HPD Kit next to a 1/60 VF-1S. 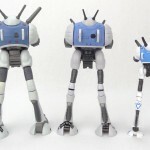 Doesn’t the Regult look a little big to be 1/60 scale? I feel it’s closer to 1/48. What are your thoughts? Just got my HA in the mail. You’re right, the only thing that has changed is the obvious. Other than that, pretty much the same exact toy. =D The HA makes it look a little more prettier. 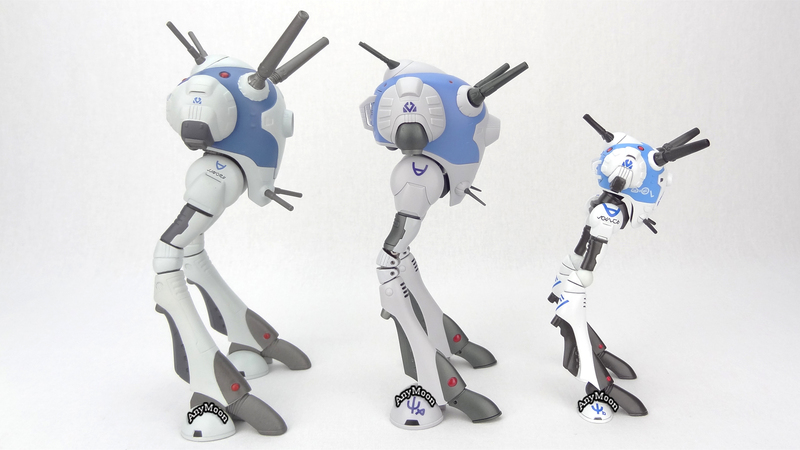 I just bought my Zentraedi Tactical Battlepod today from a local comic book store and am very happy with the quality of toy for the price. I noticed some slight painting mistakes near panels but they are barely noticeably and only when very closely inspecting the legs. Since you said the true scale of this toy is roughly 1/87 and the Bandai Hi-Metal VF-1J is actually 1/88, I’d Imagine these 2 toys will compliment each other well. 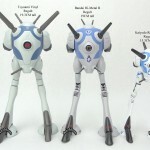 I feel so silly for not getting the DYRL exclusive green Battlepod while I was at ComicCon this year for $35. Acording to the ComicCon website they were limited to only 1000. 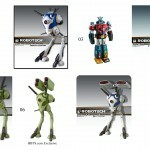 Looks like Robotech.com is going to have some for $55. 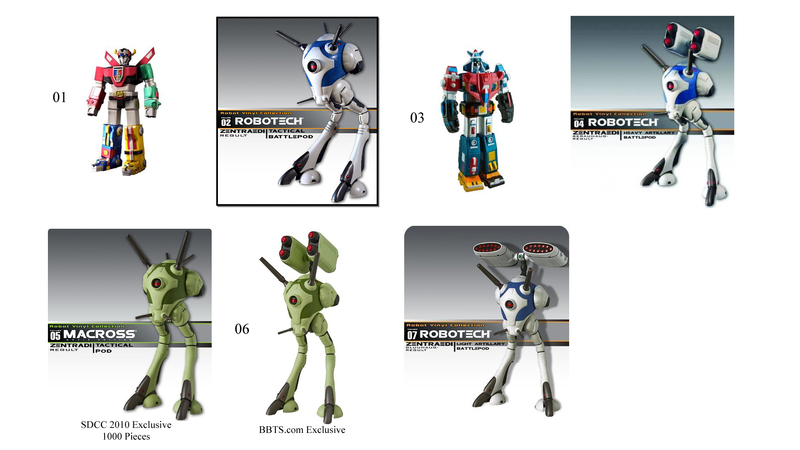 According to this image from SDCC 2010 BBTS will exclusively have the Heavy Artillery Version of the DYRL green Regult this fall. Still haven’t heard anything about when the Light Artillery Battle Pod will be out.